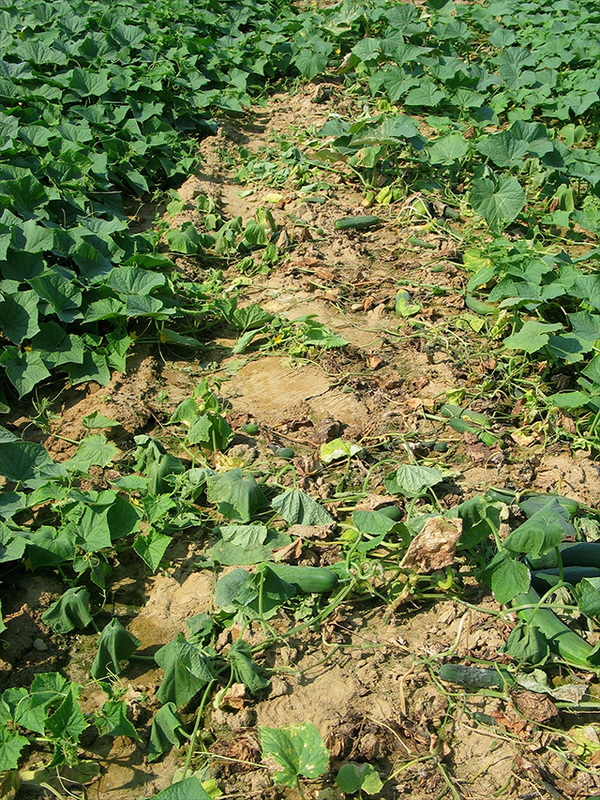 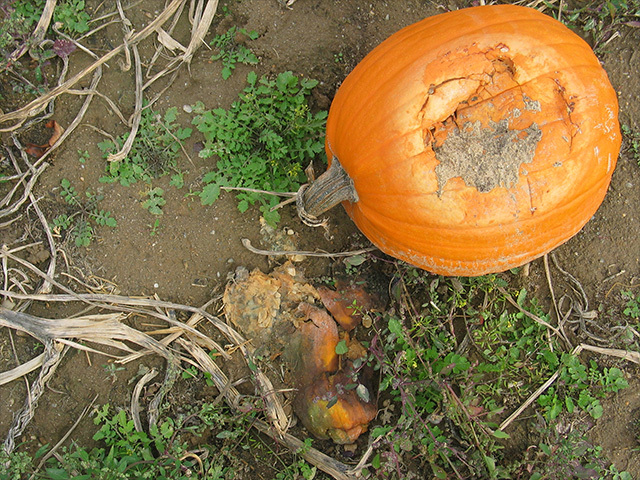 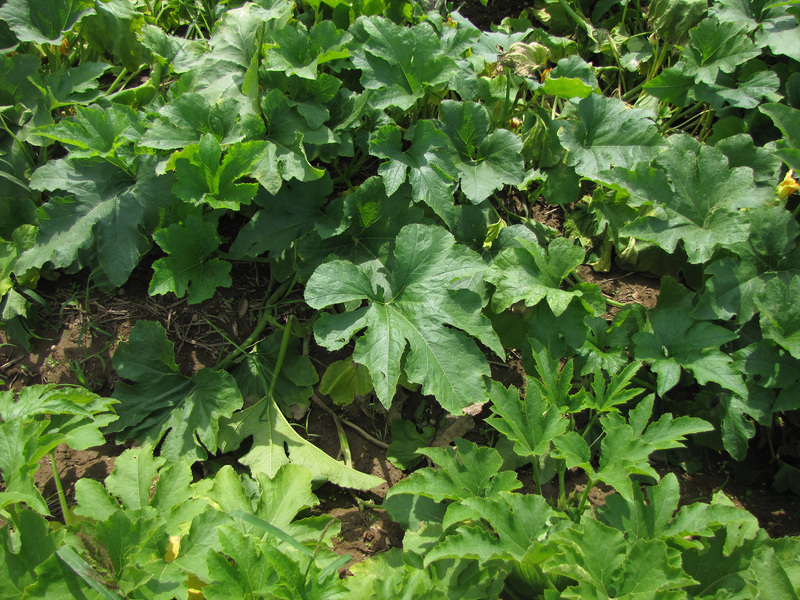 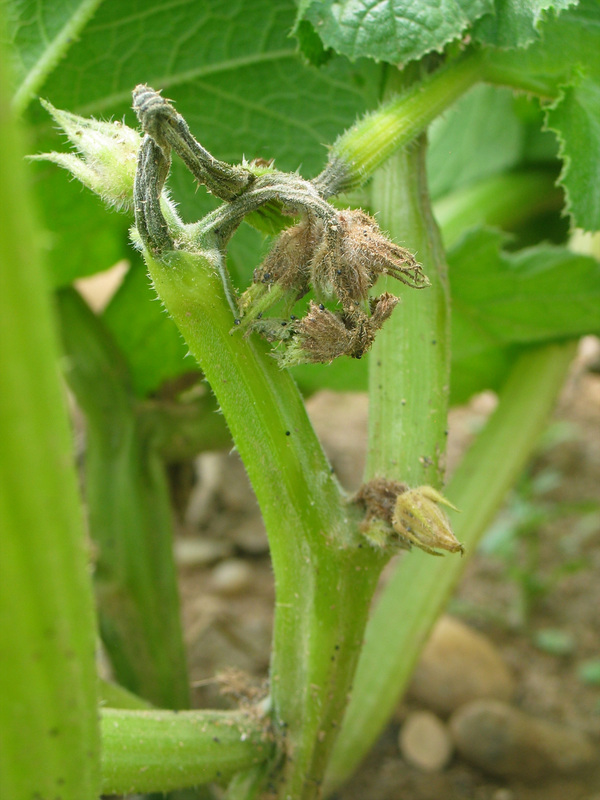 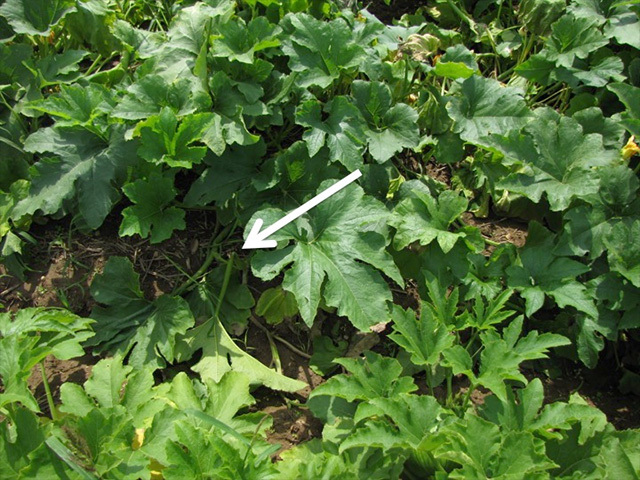 Phytophthora blight has been the most destructive disease of cucurbit crops on Long Island, and the most challenging disease to manage effectively. 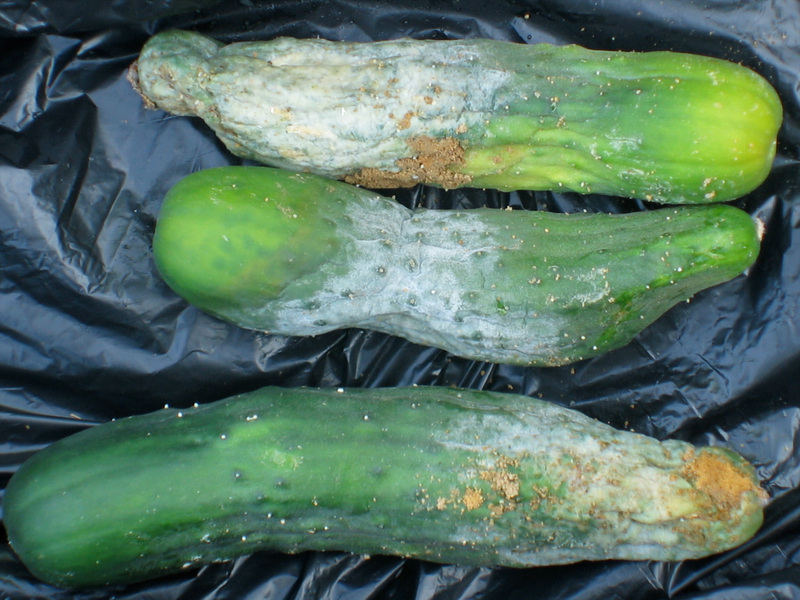 Information about this disease and its management are posted at the VegetableMD website. 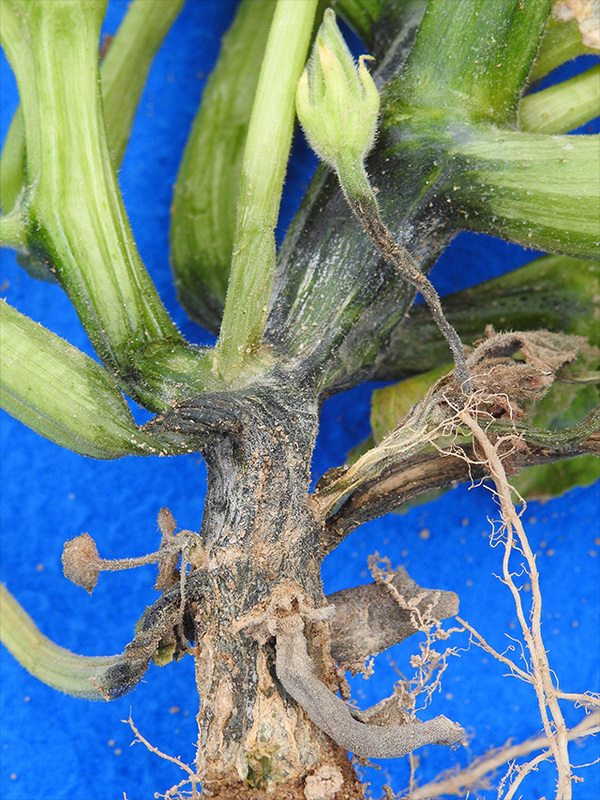 Crown rot is one of the common symptoms of Phytophthora blight. 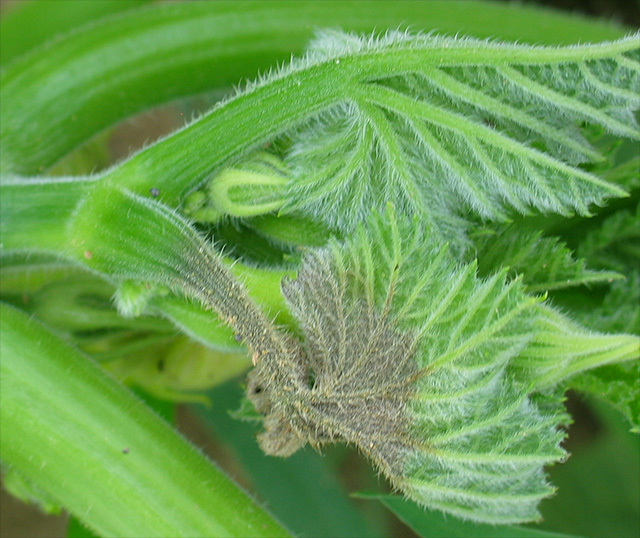 Affected tissue often looks water-soaked and collapsed, especially with young plants. 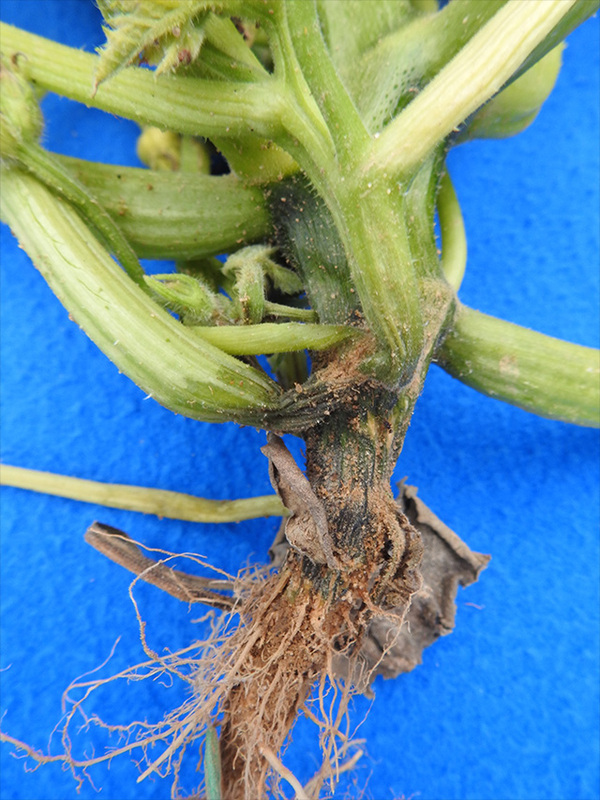 Symptoms often extend up the stem from the crown rather extending down into the taproot as occurs routinely with Fusarium crown and root rot. 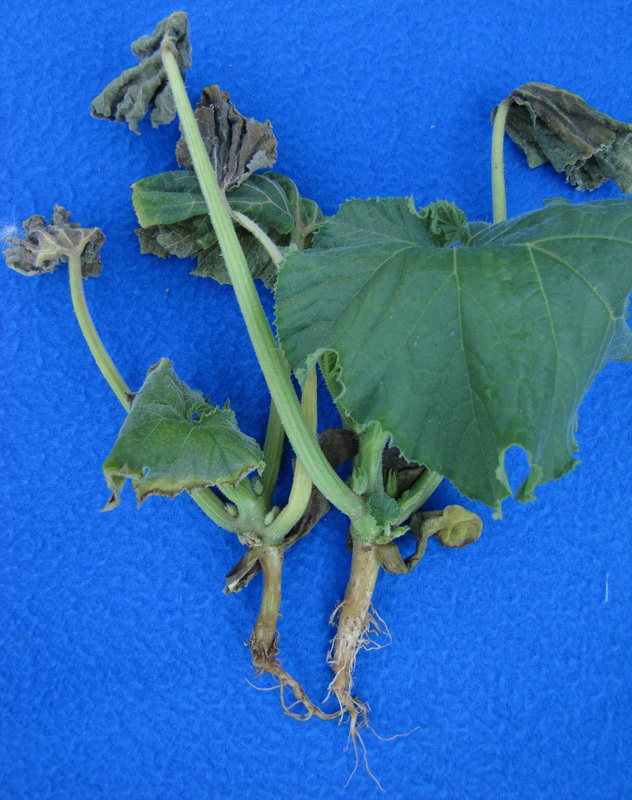 Affected plants wilt. The causal pathogen, Phytophthora capsici, sometimes can be seen on affected tissue upon close examination. 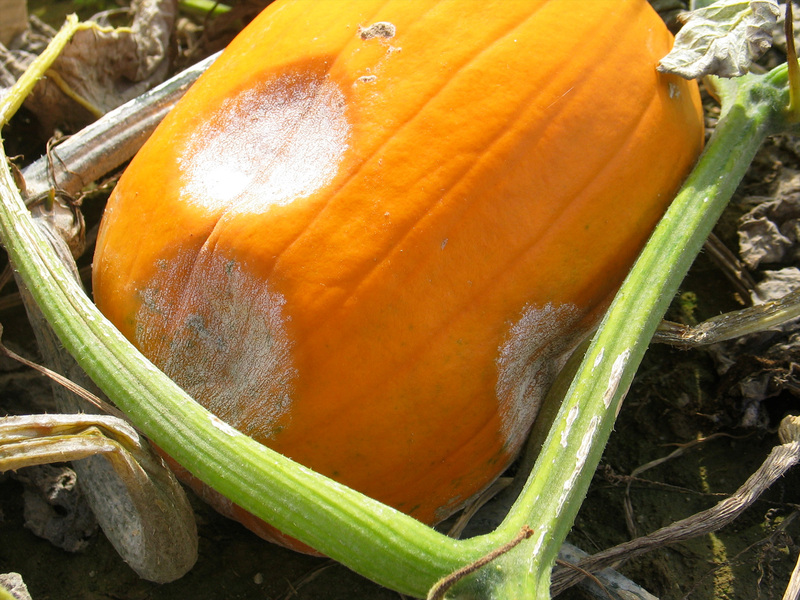 It is the white yeast-like growth in the photograph below. 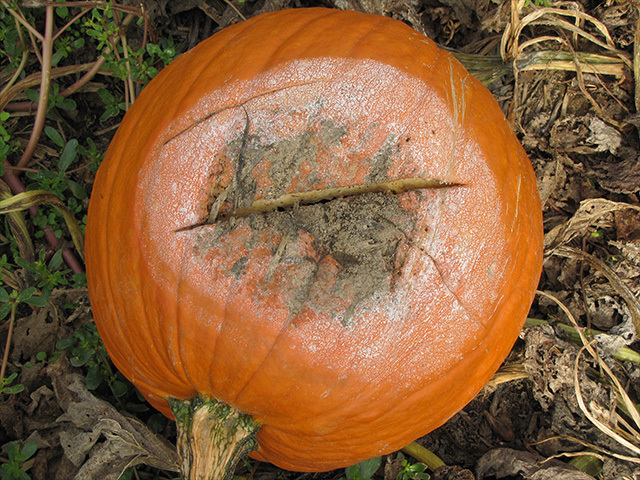 This growth is mostly spores of the pathogen, which are moved by splashing water. 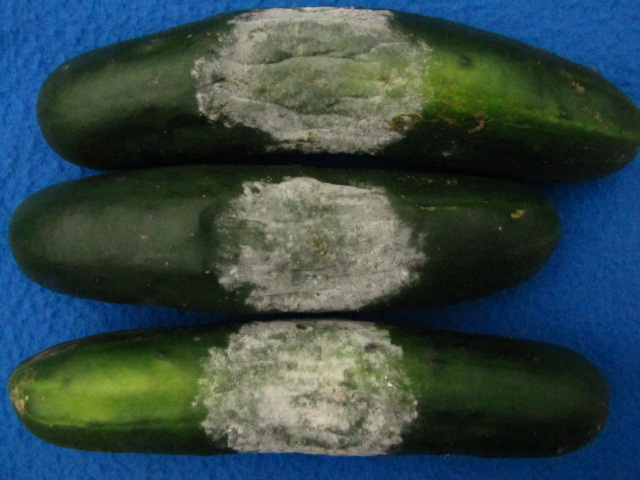 When not present, putting the stem on wet paper towel in a sealed ziplock bag overnight can provide conditions favorable for spores to form. Vine and stem tissues are also susceptible. Affected areas are initially water-soaked and then turn brown. 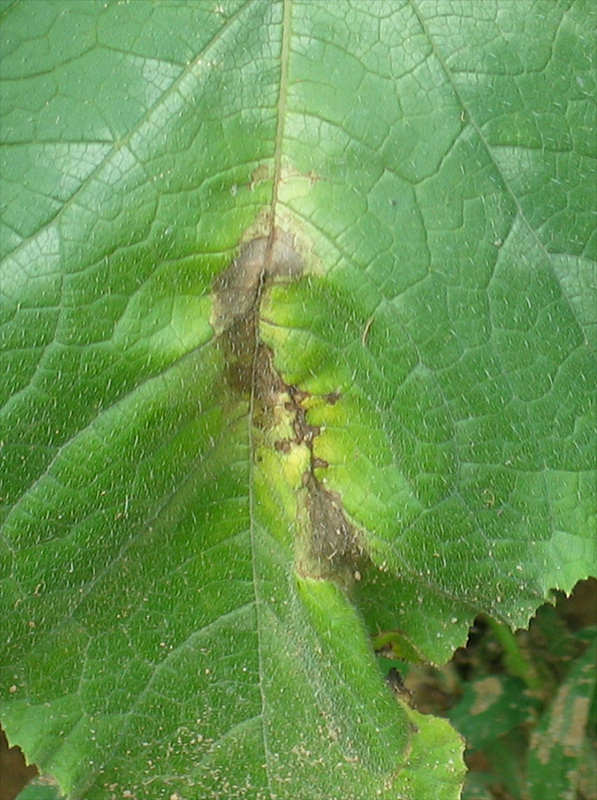 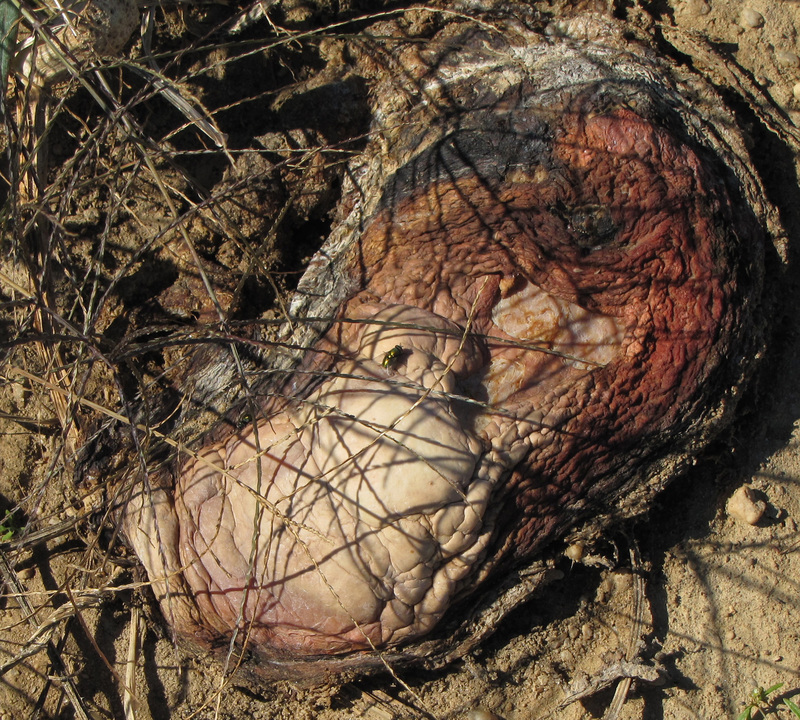 Plants with infected crown or vine tissue are killed. 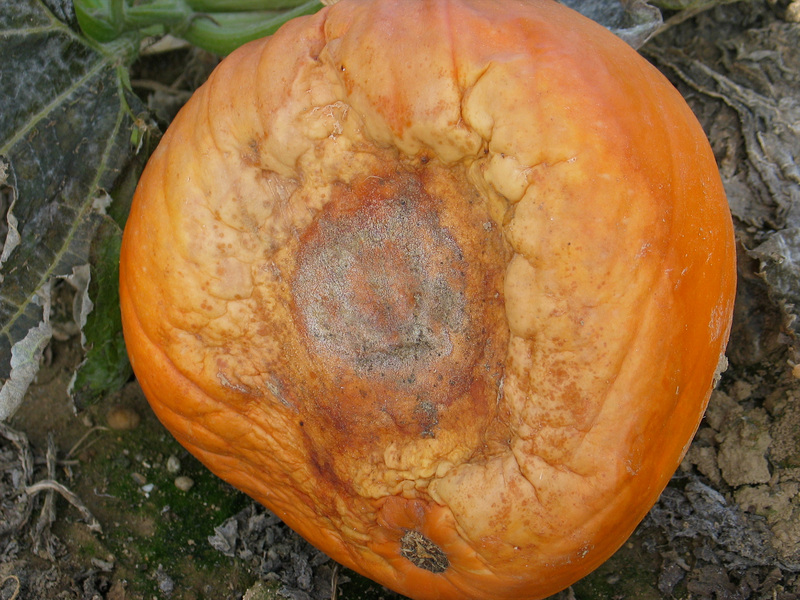 Fruit rot is a common symptom. 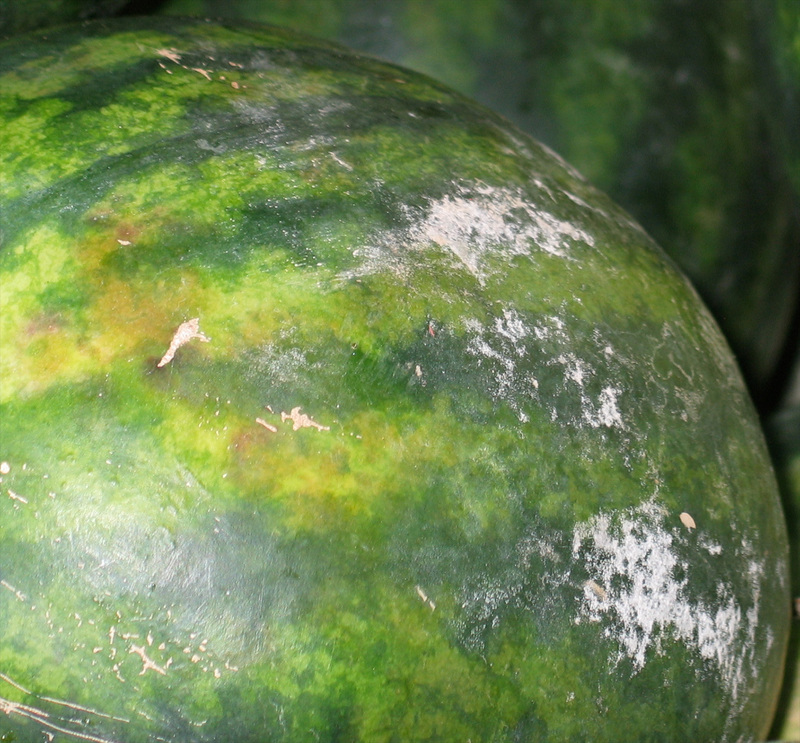 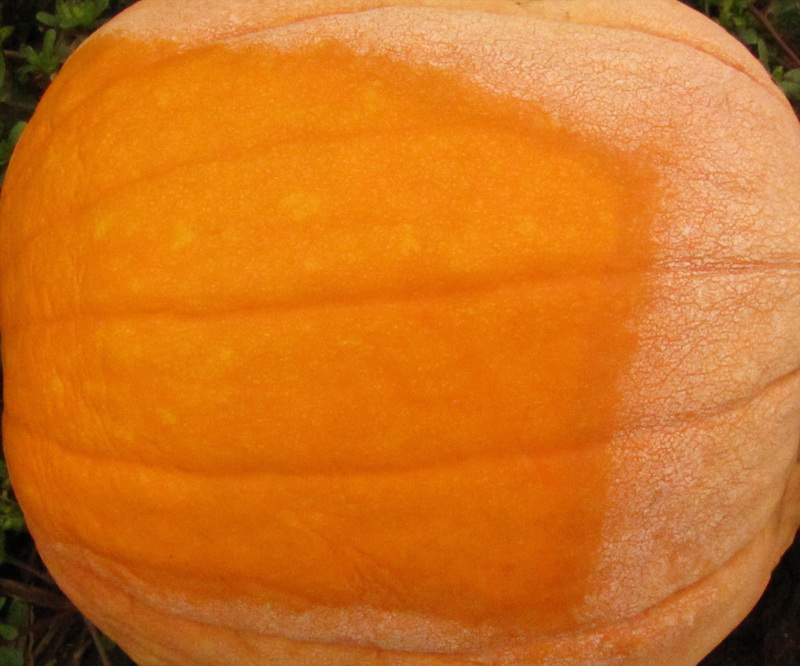 Sometimes spots develop on the top and sides of fruit resulting from splash dispersal. 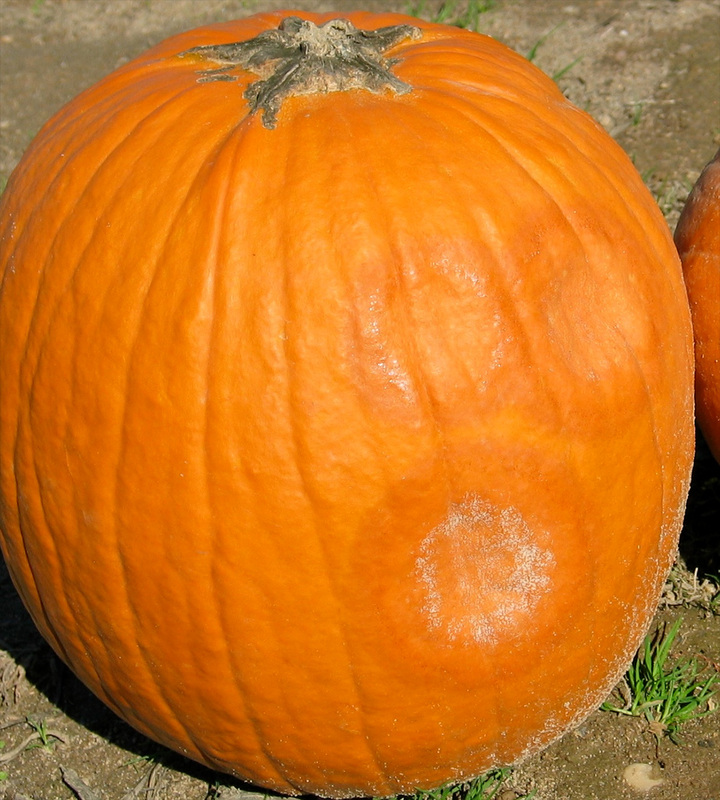 Initially spots appear water-soaked. 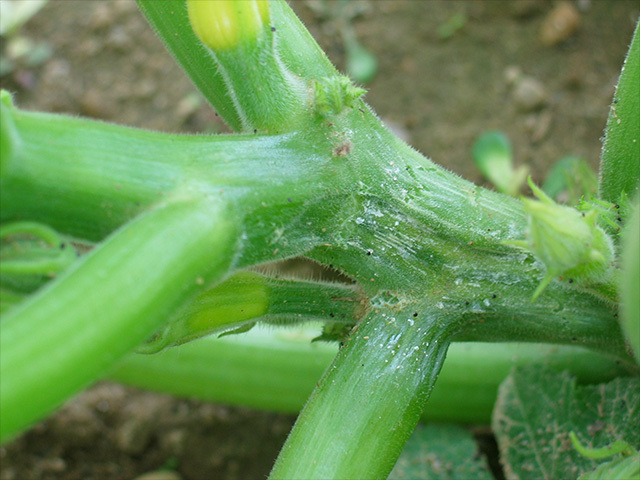 More commonly fruit become affected where in contact with soil. 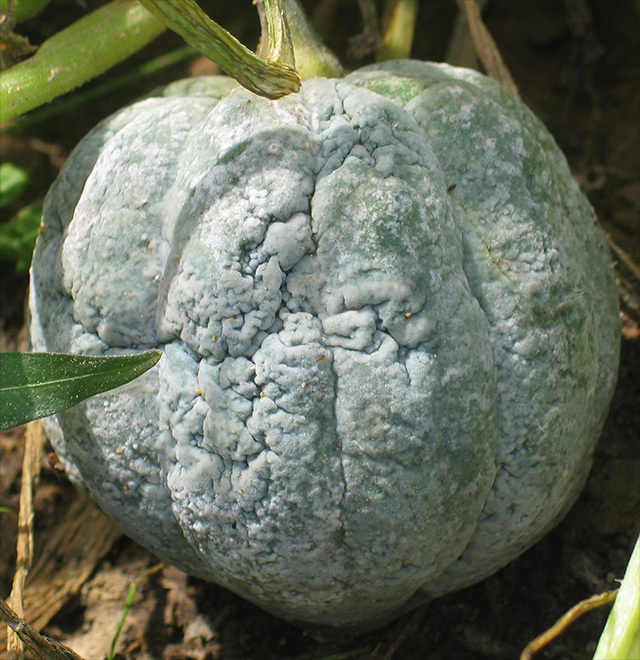 Fruit can become mostly to completely covered with pathogen spores which have a yeast-like appearance. 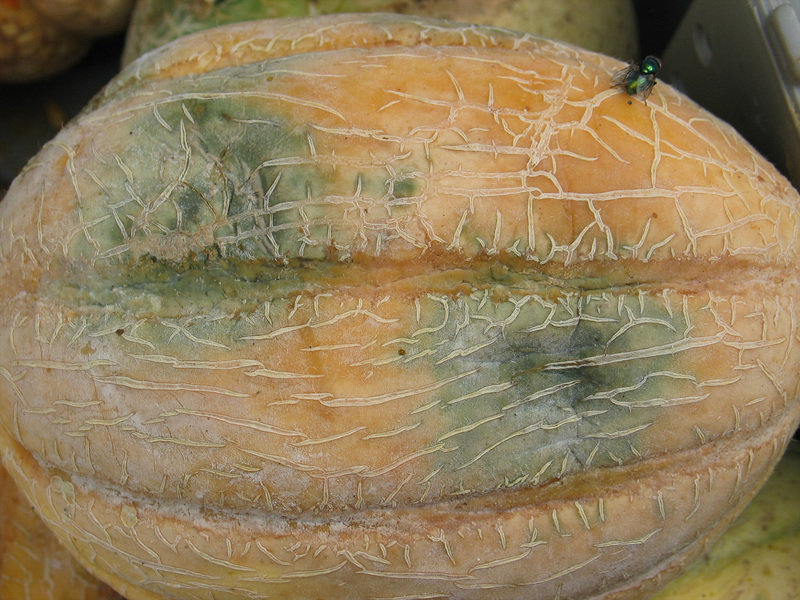 But affected fruit may have no spores. Sometimes affected tissue on a fruit is centered around a rotten stem, suggesting the pathogen moved into the fruit from affected vine tissue. Eventually the whole fruit collapses. 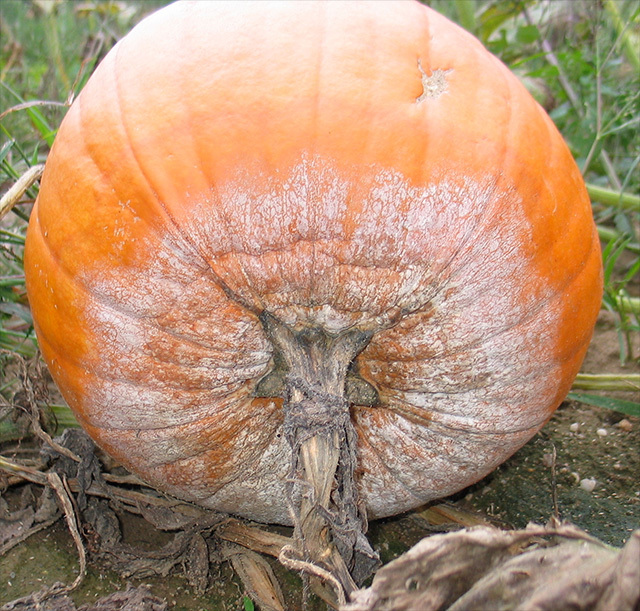 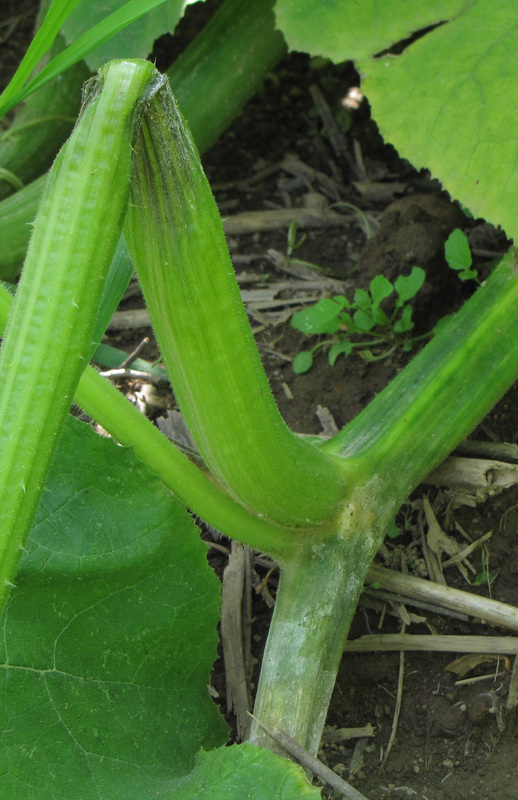 Fruit rot occurs in all cucurbits, but they vary in susceptibility with cantaloupe and pumpkin varieties that produce hard rinds being among the less susceptible. Symptoms have been less commonly seen on leaves. 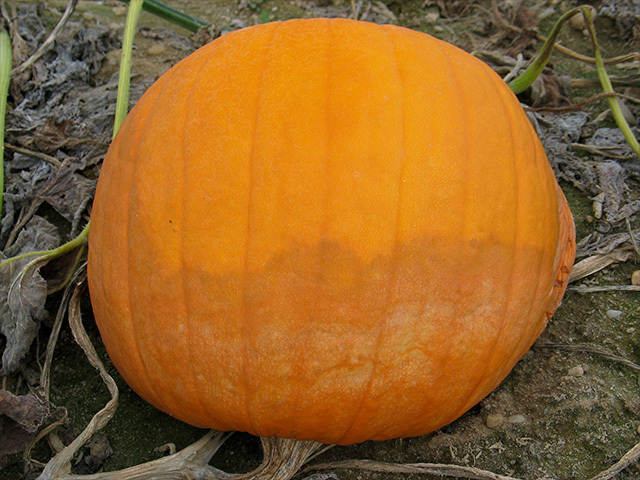 Spots are brown, often round, and can become large. 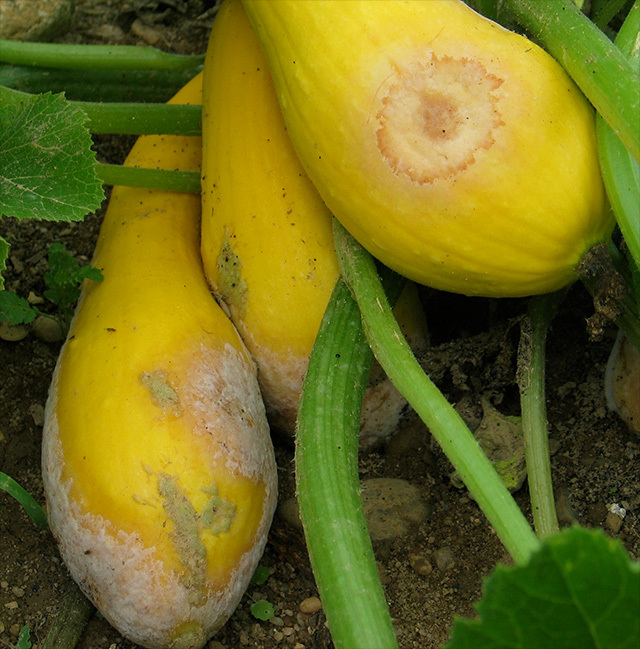 Sometimes there is a wilted, yellow border. 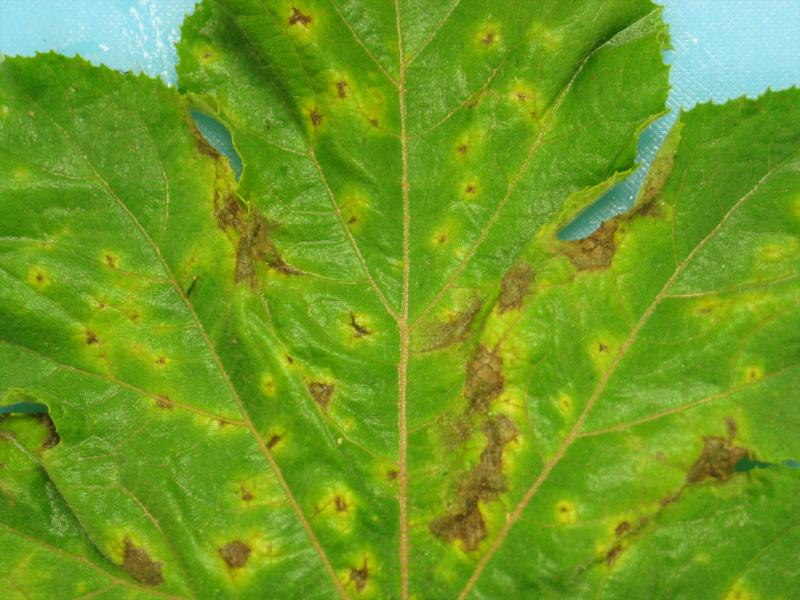 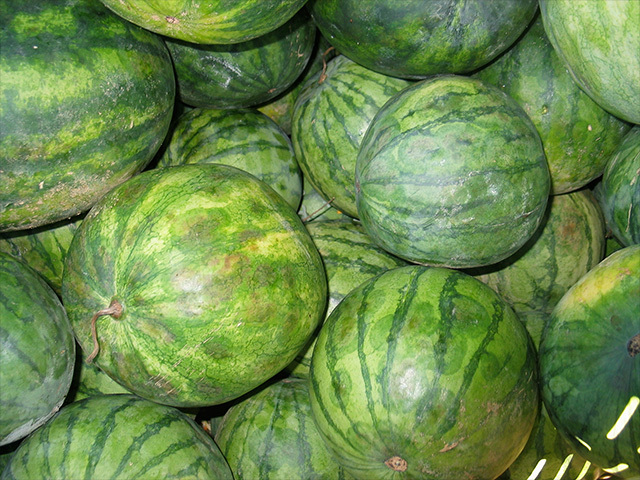 They resemble leaf spots due to late blight, which is caused by a related pathogen. 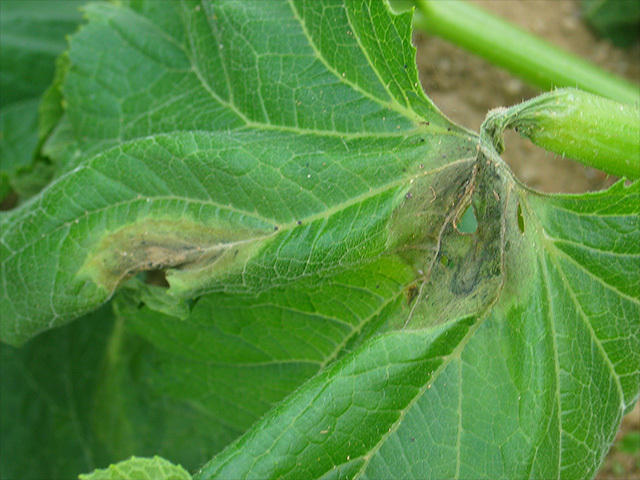 Leaf tissue in contact with soil can also be affected. 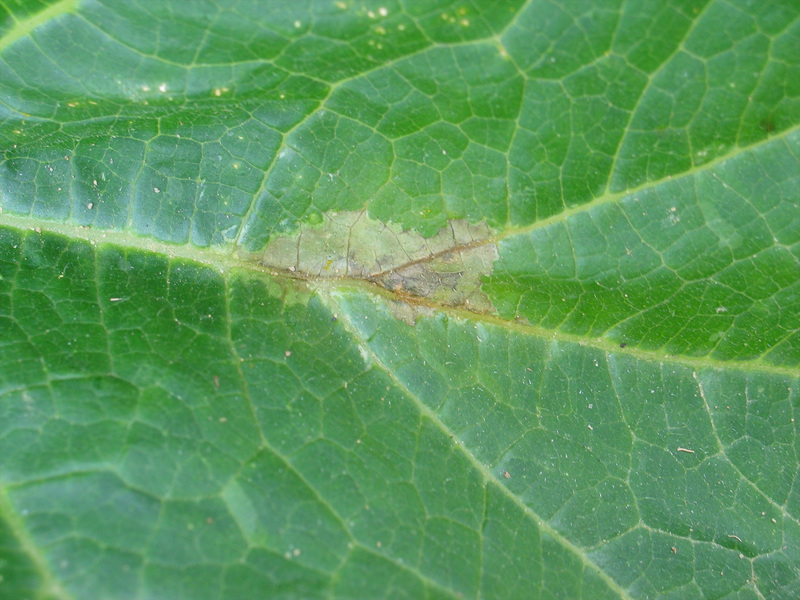 Petiole tissue is also susceptible. 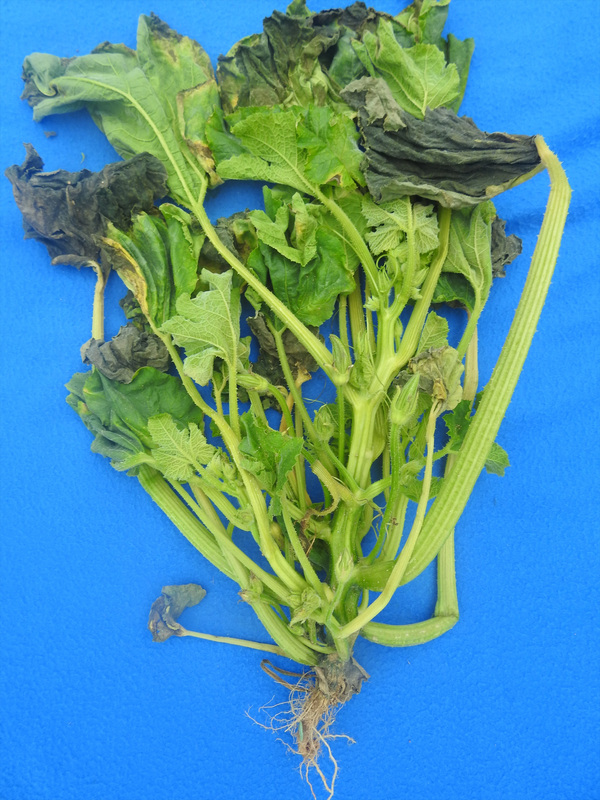 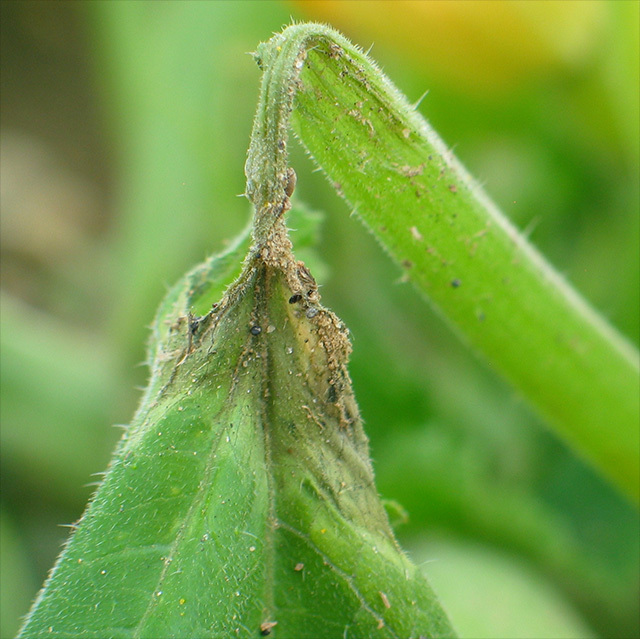 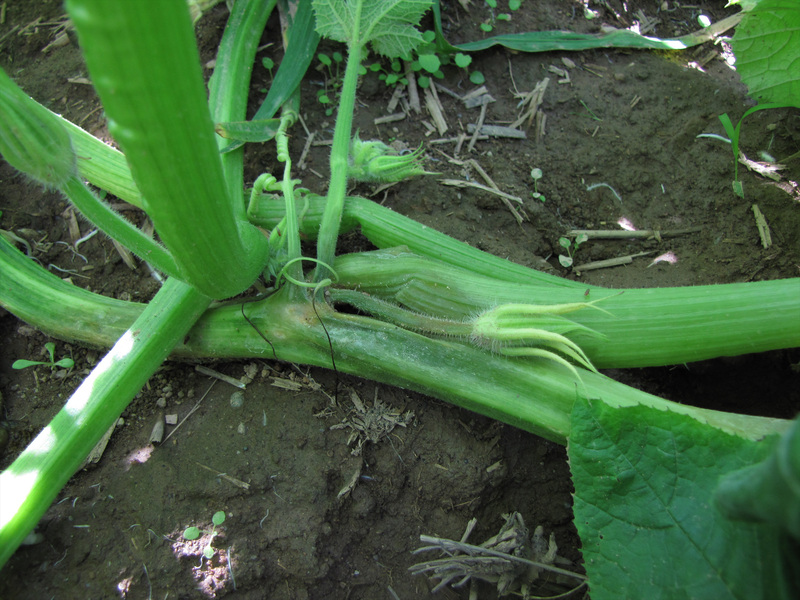 Growing tip collapses when it is infected by Phytophthora capsici.